• 280 Watt Fluorescent Kit EXPANDABLE to 560 watts! 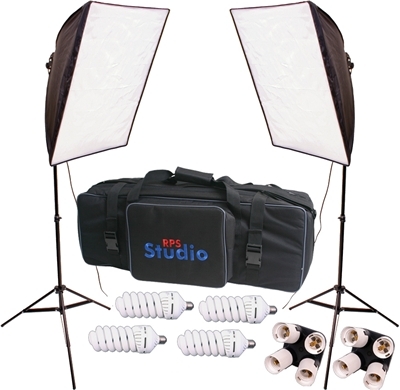 • A two-light kit for digital photography or video projects. • Softboxes open/close quickly like an umbrella but no ribs can be seen. • Each have one socket for use with Fluorescent lamps. • This kit includes 4 Fluorescent lamps but has room to add 4 more! 2 - 20'' x 20" softboxes, socket power cords. 2 - 4-in-1 Fluorescent Adapters. 2 - 6 ft Stands. 4 - 70 Watt Fluorescent Lamps. 1 - Nylon Storage Bag. This kit can be expanded to 8 fluorescent lamps!! •• ORDER EXTRA LAMPS BELOW AFTER YOU ADD TO CART - SECOND STEP! PS-4058 70 Watt High Quality Fluorescent Lamps $31.95ea.